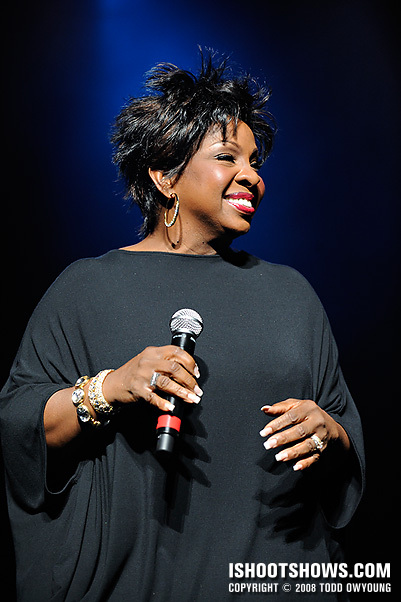 July 13, 2008 – Taking the stage with a beaming smile, Gladys Knight, the “Empress of Soul,” thrilled fans with a powerhouse performance that had the entire audience on their feet by the end of the show. 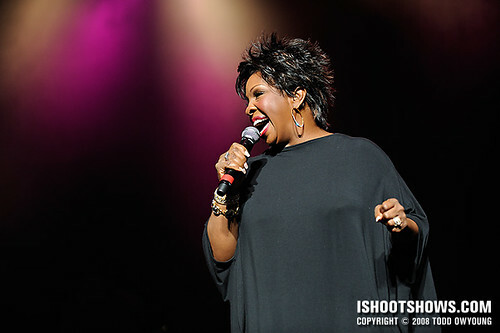 This set's alternate title is Gone in 60 Seconds, because that's the amount of time I had to photograph Gladys Knight. At an even minute and no more, this performance marks the most restrictive time limit I've had so far. 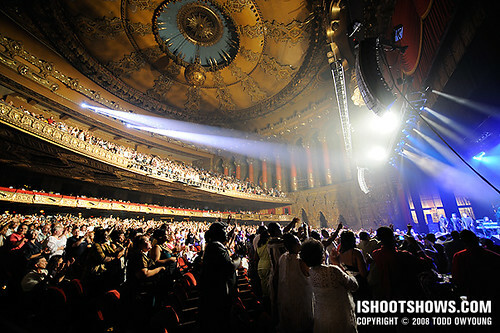 As has been par for the course at the Fabulous Fox Theatre, there was seating in the orchestra pit, and I shot from the center aisle. While I could have shot from in front of the first row, I made the executive decision that a farther and less acute angle would make the most of my shooting time. Needless to say, the 60 seconds went by in a flash, and I was being signaled that time was up just as the first song really got going! 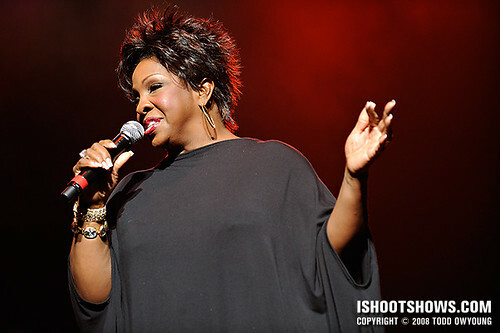 As I've come to expect, this performance was lit with two spotlights from far back in the balcony, which provided a nice, constant treatment on Gladys Knight. Background lighting was a mixed treatment that shifted between various accent colors. I used the Nikon 70-200mm f/2.8 VR on the Nikon D3 for the entirety of this set, with the exception of the last shot of the venue, which was made with the Nikon 14-24mm f2/8. Thanks to the constant lighting, I shot the entire set locked at 1/500 at f/3.5 and ISO 1600. 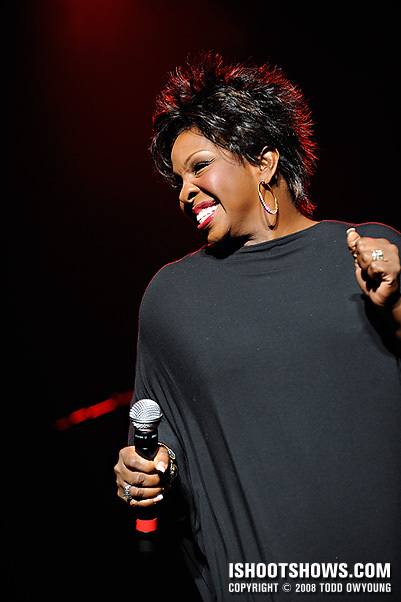 The shutter speed was plenty fast to freeze all of Gladys Knight's movements on stage. ISO 1600 is quickly becoming my favorite setting for concert work, due to the very clean files and great overall image quality. Even though these images were shot during only the first minute of the performance (excluding the overall wide venue shot), those 60 seconds seemed longer than you'd think. Maybe this is just proof of Parkinson's Law. Ha, who knows. But 20 seconds with Aretha Franklin? Sure, I’ll take it. But really, the 60 seconds actually didn’t seem that short while I was shooting. I know that the security personnel center stage was timing me with his watch, but for whatever reason, I didn’t actually feel that significantly more rushed at the time than I do while shooting with a three song limit. You know, I may just have to start limiting myself to three songs even when I have no restrictions. I’ve always been a big fan of personally applied constraints. This is a bit difficult shooting the locals as they don’t really get into it until the second set when the club starts filling up. Anyway, I think it may help certain aspects of my shooting. Always a pleasure to see real old school talent bringing the real deal. Constraints can definitely help, I agree. They can give more focus to one’s shooting. With a tight constraint like just a minute or two, I think the shoot becomes much more about just doing and not over-thinking it or waiting for a “better” moment. It’s really hard to believe that these shots were all taken in a minute, plus the “duds”, etc… Well this is one case maybe the continuous shooting mode could be one of your best friends! Hey Celso, thanks for your thoughts on this one. I definitely bumped up the continuous rate to 6 frames per second from 5 for this show. The flexibilityy of the 70-200mm definitely played a nice role in creating diversity in the set, that’s for sure. A lens change could have eaten up several precious seconds, but who knows, maybe I’d try that next time. No, probably not. The photos look great. She looks so energetic and beautiful. Hey Andy, thanks for the comment. Actually, that tech note about the lens was not entirely accurate, I did use the 14-24mm for the “atmosphere” shot. I was referring to the performance shots for the lens/gear info, I’ll make the correction! Thanks for the feedback on this set! 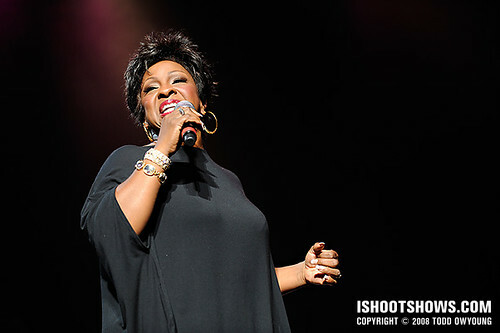 Gladys looked great on stage and seemed filled with energy. Sometimes a limitation (like one minute of shooting time) is a good thing, It’s challenging and keeps you on your toes, and, judging by what you got, you came thru with flying colors. I agree, sometimes restraints are what can foster compelling work. The challenge was certainly there and it made me conscious about nailing all of my must-have shots right off the bat instead of waiting or maneuvering for different angles. Sometimes you just have to work with what you have and run with it. Thanks for the feedback! Wow, I’m amazed at what you managed to shoot in just 60 seconds. Bravo! That last shot of the entire Theatre is definitely my favourite, did you also use the 70-200 there? Hey João, great to hear from you, thanks very much for the comment. My mistake in the notes, I used the Nikon 14-24mm f/2.8 for that last atmopsheric shot. 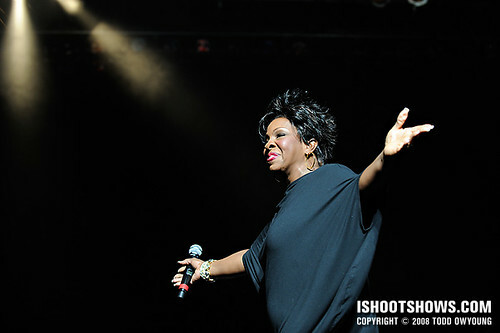 I was actually about 3-4 meters back from Gladys Knight while photographing her. I decided to hang back in the aisle so I got a more flattering head-on angle, rather than shooting up steeply from right at the front of the stage. 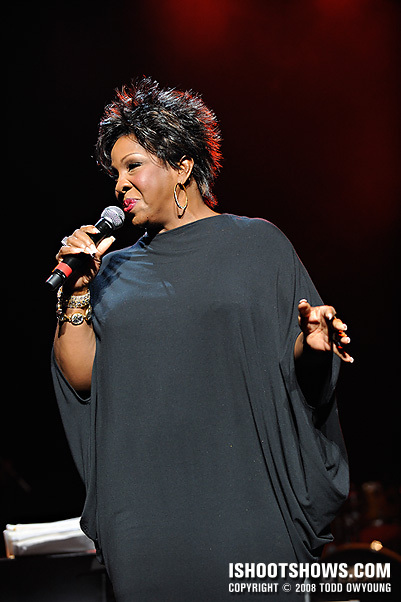 These are wonderful photos; you did the Empress of Soul justice. Thanks very much, I’m glad to hear that from a fan! Just amazing Todd. Not so much for the quality of the photos, which is the same you usually present us with, but for the fact that you were able to do these fantastic shots with just 60 seconds. Hey Daniel, thanks for the kind comment. The 60 seconds went by pretty quickly, though I was expecting it to be even shorter. As it was, I felt just a little rushed, but in a good way. ww: Really? I just guessed. Well, an educated guess. I knew the ballpark exposure of these particular spotlights at full blast, since I’d shot in the venue before, so I dialed that in from the start. Then I did one quick look at the LCD to check the histogram and review image (which, on the D3, is really quite accurate), then went to work for the remaining 55 seconds. Fab shots, as always. I so appreciate your detailed shooting notes and sharing your process. It’s really helped me to grow as a concert photographer. You mentor many of us by blogging your experiences. Many Thanks! Todd, with the dark background and her black outfit, did you spot meter for the skin tone or matrix for the overall exposure? Hey Paige, thanks so much. I’m thrilled to hear if the shooting notes are helping, as they’re for all the other photographers like you out there. I’m glad to hear that ishootshows.com is helping!